A massive fire has engulfed a warehouse at a steel plant located near Tokyo's Haneda Airport, sending thick black smoke into the air. A fire department official confirmed that the heavy smoke was coming from a major fire at the facility which is owned by steelmaking giant Nippon Steel & Sumitomo Metal. Local media reports that the fire department has dispatched at least 17 trucks to battle the flames in addition to a helicopter. “A fire broke out from a two-meter cooling tower,” the official said giving no further details, according to AFP. 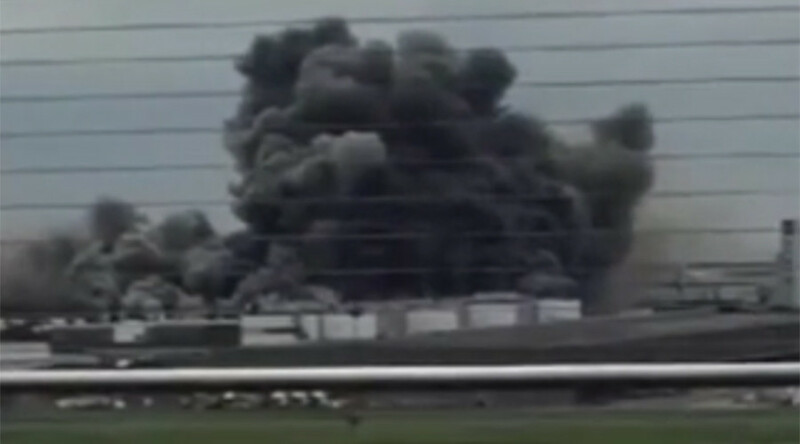 Japanese television broadcast images showing plumes of thick black smoke and flames shooting up into the air. Local news reports, citing the fire department, that the fire has spread to Kao Corporation’s Kawasaki factory, prompting the evacuation of employees over safety concerns. Witnesses have also shared pictures of the fire online. The blaze could be clearly seen from both inside the airport’s terminal and the planes on the runway. According to the Ministry of Land, Infrastructure and Transport, the fire has had no impact on the take-off and landing of planes at Haneda Airport. The flaming building appears to be a one-story warehouse. There have been no immediate reports of injuries or casualties. The fire near Tokyo’s Haneda Airport comes mere hours after a blast ripped through a warehouse at a US military base near Tokyo, triggering a blaze which took hours to put out.